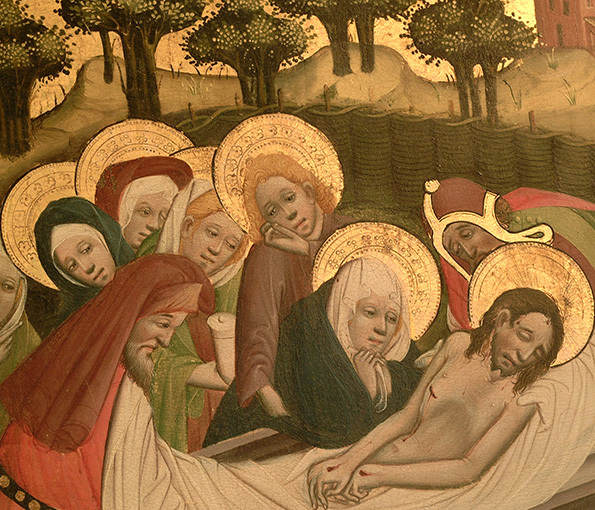 Medieval European art existed in the service of the Catholic Church. People’s lives were shaped by Christian doctrine. They would bow the knee before altarpieces, statues of the Virgin Mary and crucifixes, say a prayer and light a candle. 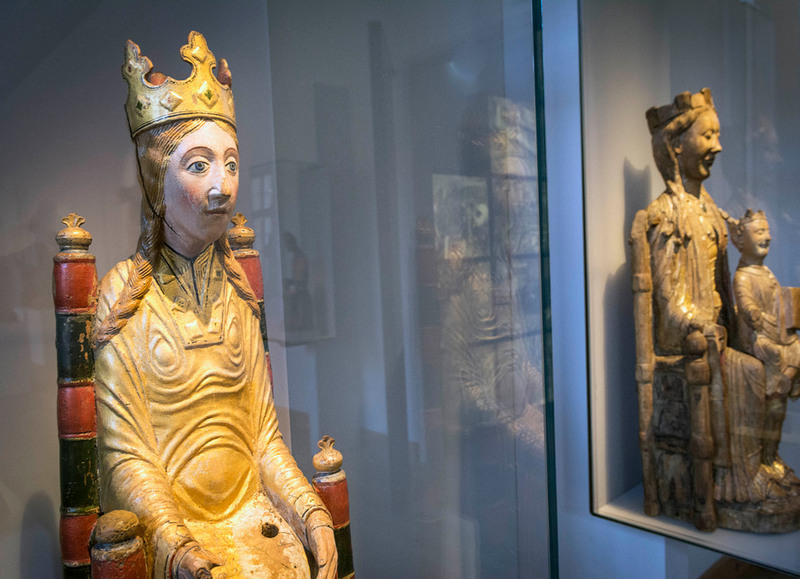 In this exhibition you can see unique objects which were once part of the Catholic ecclesiastical milieu, starting in the 11th century and continuing throughout the medieval period. Sweden was a Catholic country until the 16th century, when it broke with Rome and introduced Lutheran Protestantism. The History Museum began collecting the medieval ecclesiastical heritage at the end of the 19th century. You will find the exhibition Medieval Art on the first floor. Christianity gave the Scandinavians a new world picture. Life and death were now explained in a new way, and artists portrayed the new themes. Often their pictorial narratives had to do with the Christian hope of resurrection and eternal life, as in the case of the Botkyrka monument on display here. The stone sarcophagus was made for Björn, who built the first church at Botkyrka, near Stockholm, in the 12th century. Every church had to have a baptismal font, a triumphal crucifix (rood) and carvings of saints. This made the Church a powerful force behind the setting up of art workshops and the importation of art from other countries. True to earlier building traditions, many of the oldest churches were of wood. A plank from Gotland, in this exhibition comes from a wooden stave church built in the 12th century but was later incorporated in the inner wall of a new church. The painting on it, showing the Ascension, shows traces of Byzantine influence. You can also see a baptismal font made of wood from Jämtland, which has motifs from Old Norse sagas. These were woven into the new religion, thereby acquiring a different meaning. The font has a prehistoric pictorial narrative about the heathen Gunnar in the snake pit, now with Christian overtones. The Madonna from Mosjö in Närke dates from the 12th century and is one of the oldest of its kind. She is carved in lime wood and painted in thin, bright colours. She once had a Christ Child on her knee. Medieval art was international from the very outset, as is clearly instanced by the Madonna carving from Viklau, Gotland, dated to the 1170s. A cavity in her skull contains a linen bag with a relic in the form of a tiny bone. The Viklau Madonna represents the contemporary ideal of beauty and is executed in the same style as stone carvings in the great churches of Germany and France, such as the west front of Chartres Cathedral. Her good state of preservation and fine colouring make her unique in Sweden. St Catherine of Alexandria, from a church in Uppland, is of a more unusual kind. 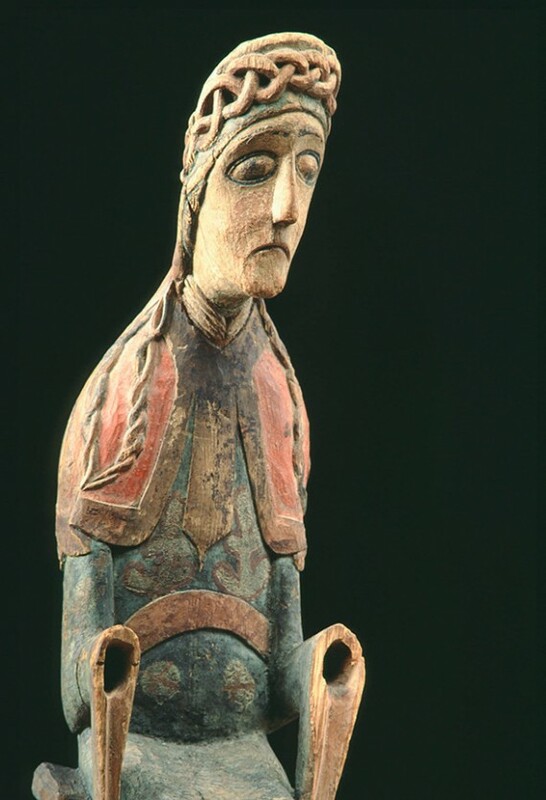 It was uncommon for female saints to be shown with underlying figures. Catherine is shown trampling underfoot the King of Egypt, who commanded her execution. 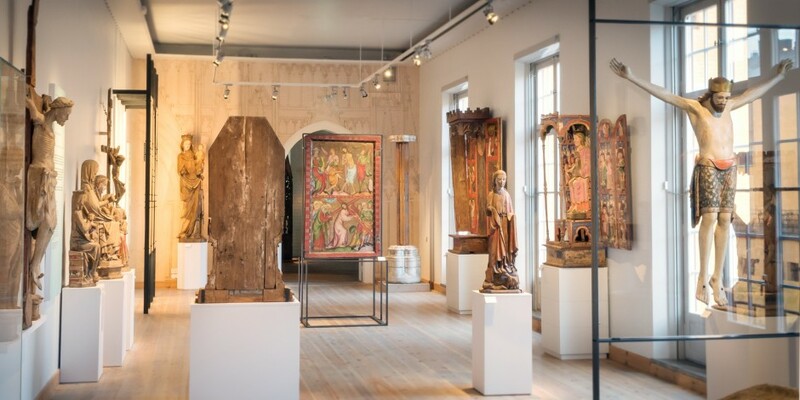 Here you can also study the most magnificent altar and crucifix to have come down to us from the Swedish Middle Ages, from Broddetorp in Västergötland. The front of the altar, referred to as an antemensal, has been dated to the second half of the 12th century. It is made of gilt copper on a wooden base and decorated with rock crystals. In the centre we see Christ in Majesty, with images of the Apostles beneath him. The pictures on the left tell the story of the Nativity, while those on the right show the arrest and death of Christ. An inscription along the top records that there were relics of the saints in the church. There is also an ornamental inscription, based on prototypes from Moslem art. A new style, Gothic, became paramount in the 13th and 14th centuries. In the cities of Uppsala, Linköping, Växjö and Strängnäs, cathedrals were built or rebuilt in accordance with the new ideals. Art too was affected, and you have a fine example of this in the figure of St Olof from Gotland. The rich colouring of this carving has long since faded. The figure itself is the work of a 14th century sculptor who was influenced by contemporary German and French art. The subject is King Olof of Norway, one of the most popular patron saints in Scandinavia. 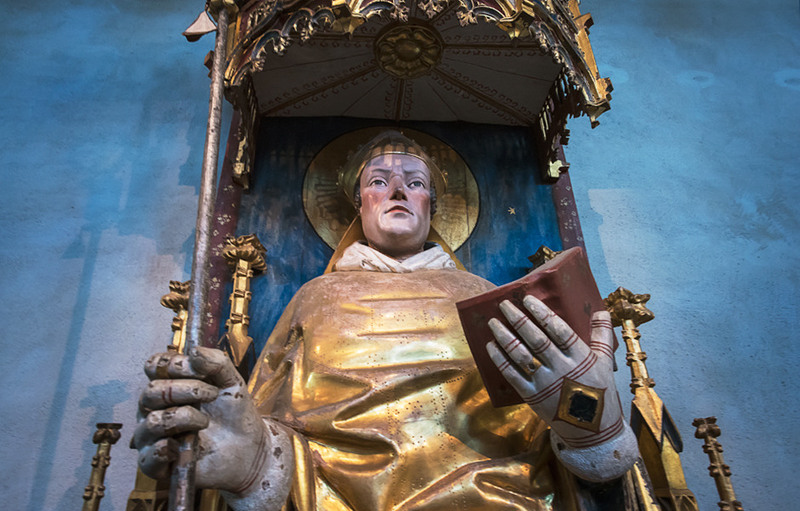 This exhibition also includes a standing figure of St Olof, presented by the parish of Frötuna in Uppland. The soldier beneath Olof’s feet represents his killer. Close by is a queenly Madonna statue from Gästrikland, originally meant to be placed on an altar. The symbolic soaring of the Gothic style heavenwards is expressed, for example, by the tall stained-glass windows of the cathedrals and the light admitted by them. The same thoughts influenced smaller churches in both town and country. Here you can see 13th and 14th century stained glass windows from country churches on Gotland. The pieces of stained glass are held together by a net of lead. 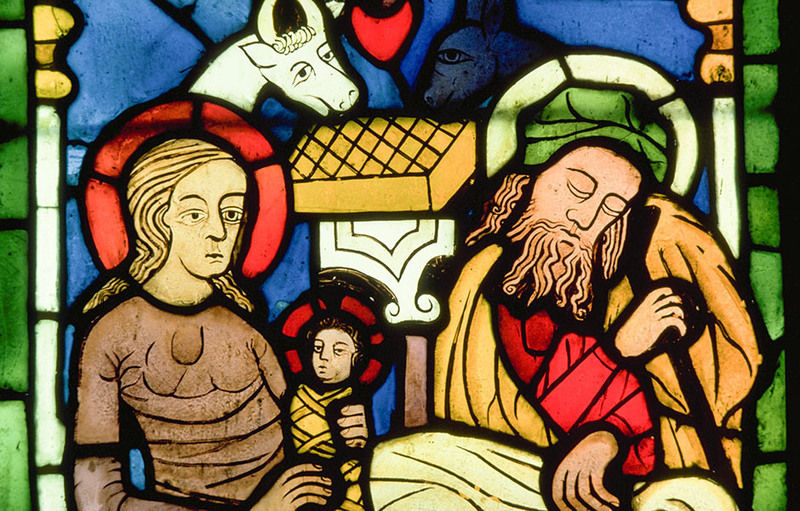 The imagery and execution of stained glass influenced other kinds of art. The altarpiece door from Toresund, Södermanland, is early 14th century. The scenes on it are depicted with the same undulation and with the same composition of fields in contrasting colours as the stained-glass windows. Altarpieces and figures of the saints played a very important part in churches. They can be likened to the picture books of our own time. Studying the elaborate and richly coloured adornments of these altarpieces and shrines, people could trace the Bible stories of Jesus, the Virgin Mary and the saints. Altarpieces and shrines were opened and closed on different occasions, and the themes and scenes displayed varied accordingly. They were an aid to devotion. Most of the altarpieces in the church-like room ”the Gothic Hall” date from the closing years of the 14th century and from the 15th, i.e. the Late Medieval period. Several of them are influenced by the International Gothic style (also termed “the beautiful style” or “the soft style”) which evolved in northern Europe and Italy, presenting an idealised world of exaggerated beauty and luxury. Consider the altarpiece from Kumla in Närke. Here one can also see that the landscape behind the main motifs has grown increasingly important. Altarpieces were very expensive and were often presented to the Church by people in the upper echelons of society. In the towns, an economically and culturally strong burgher class had evolved which vied with the nobility for power and influence and was keen to manifest its wealth. Sometimes the donors even had their portraits or armorial shields included. 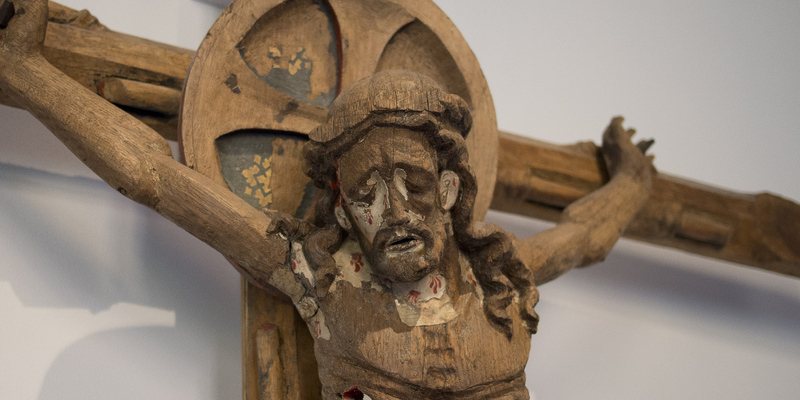 In this exhibition the donor is portrayed next to a Golgotha scene, known as a Calvary group, from Trehörna Church in Östergötland. This group formerly stood in Vadstena Convent, Östergötland. The original colours are well preserved, the style vigorous and down-to-earth. The donor portrayed was Beno Korp, Bishop in the town of Västerås c. 1384–1395. Lübeck, throughout the Middle Ages, was a big metropolis of art, as well as being a leading Hanseatic city in the Baltic region. Many of the altarpieces on display were made there, and some of the artists engaged to decorate them are known to us by name. Herman Rode is one of them. He painted the Storkyrkan altarpiece in Stockholm. The bright, clear colours have stayed fresh for over 500 years now; the altarpiece was consecrated in 1468. The same artist or workshop executed the altarpiece Salem in Södermanland which is also to be seen here. were often included in altarpieces, even when the latter were purchased from abroad. It was important, for example, that the church’s patron saint be depicted. These saints were an important part of faith and a link with God, in addition to working miracles on earth. Many altarpieces depict events in the lives of the saints. Parallel to the importation of shrines and altarpieces, a native production started, sometimes by migrant German masters and sometimes by Swedish craftsmen known to us by name. Among of the finest specimens from the closing years of the 15th century is the altarpiece from Odensala in Uppland. The Virgin Mary played a vital role among the faithful from early Church history onwards. Her importance grew steadily, culminating in the 15th century, and this is mirrored in art. Images of the sorrowing Virgin holding the body of her dead son were prominently positioned in churches. One such Pietà comes from Skederid in Uppland and dates from the 1470s. Images like this were meant to arouse empathy and fellow-feeling with Christ and with the Virgin Mary in her grief. Sometimes she provided the main motif for the high altar, as for example in the altarpiece from Odensala, which shows her standing on a crescent moon, wreathed in a blazing sun and surrounded by a garland of roses. In this exhibition you can also see a wooden carving of the English saint Thomas Becket, shown here as a powerful prelate. He was Archbishop of Canterbury and was murdered in his cathedral in 1170. He was swiftly canonised and came to be venerated all over Europe. The latest ecclesiastical art in this exhibition is 16th century. Now one senses a new idiom, the Renaissance. Look at the female saints and their colourful apparel on the doors of the altarpiece from Västra Ed in Småland. It stands at one end of this gallery (the Gothic Hall). An inscription records that the altarpiece was made by a north German master in 1526. The base (predella) shows St George and the Dragon. That was a popular theme, and St George was adopted as a patron saint in various parts of the world. The exhibition also includes an oak carving of the princess in a St George group. She comes from a church in Södermanland, but was made in Lübeck by Master Henning van der Heide in the 1490s. At one end of the Gothic Hall you will find a small entrance to a reconstructed 12th century – Romanesque – church. There’s time to rest here, so sit down for a while. with an antemensal (decorated front). Later an altarpiece (reredos) was often fitted to it. Usually there would also be a relic here, often a tiny bone of a saint. The chancel had a seat for the priest and a bell which he would ring during mass at the point where the bread and wine were transubstantiated into the flesh and blood of Christ. The congregation were debarred from the chancel, which, accordingly, was screened off from the nave. 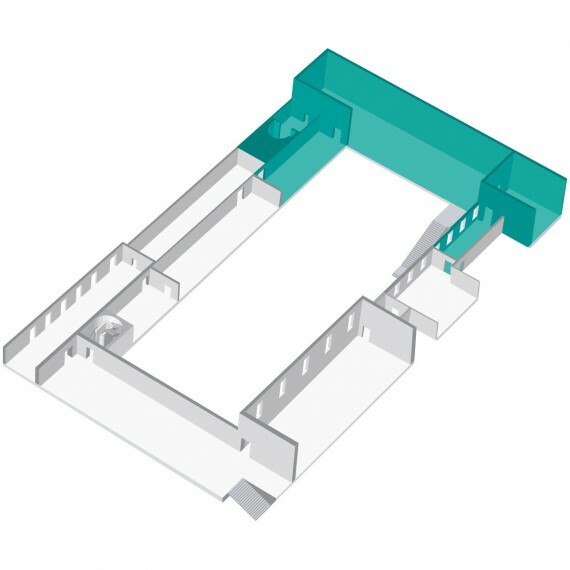 The opening between chancel and nave is called the triumphal arch, and was hung with a crucifix – a triumphal crucifix. The parishioners assembled in the nave of the church, the women standing on the north side, the men on the south. The baptismal font stood at the far western end of the church, just inside the door. The unbaptised child was considered impure and therefore should not be carried further inside the church than necessary. Baptism was the entry into the Christian faith. The nave had two altars against the chancel wall. The one on the women’s side was dedicated to the Virgin Mary, and that on the men’s side would be dedicated to a saint, often the patron saint of the church concerned.